You're playing in a multiple deck game where the option of soft doubling is allowed. You are dealt an Ace and a five while the dealer gives himself a two. With your Ace-five hand, you have a starting point where you have either 6 or 16 - whatever proves most advantageous to you. As a result, you've got options - you can stand, hit, or double down. Which of these options do you go with here? Standing wouldn't appear to make a whole lot of sense. And don't get carried away with the idea of doubling. What you need to do here is hit this soft hand. Is the two a weak enough dealer upcard to double AGAINST? Well, the answer to the first question is yes, usually. The Ace-five gives you the 6 or 16, and there are a lot of hands you could get that could be worse. 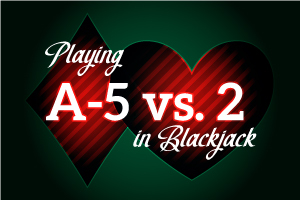 In fact, you WILL double this hand against the dealer's upcard of 4,5, or 6. However, the answer to the second question is, NO, the two is not weak enough here. It allows the dealer too much of a chance to get pat (i.e., deal himself a solid or standing hand). The mathematical summation is that with this hand you have an overall negative expectation; you will win 1% MORE and lose 1% LESS if you hit the hand as opposed to doubling it.